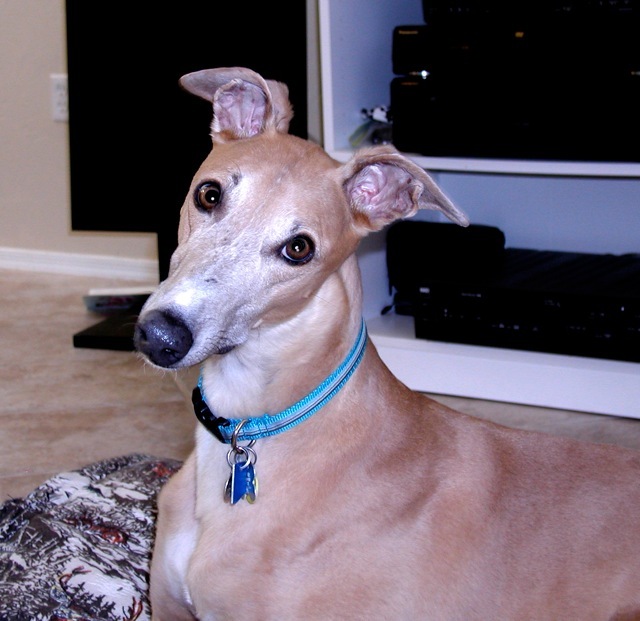 Tucson greyhound, Buddy assistance dog – Got culture? This is Buddy, a greyhound assistance dog who lives in Tucson. You can read more about Buddy here and here. Update: Today-July 1, 2010, Buddy went to the Rainbow Bridge. He is now free of pain and suffering and goes to join all our beloved greyhounds and other pets who have gone on before him. Buddy’s eye cancer was inoperable. Buddy raced 155 times. Life should have been much kinder to him. We have no idea what harsh realities Buddy endured during his racing career. We have no idea why racing exists except for the greed and amusement of man and to wager a $2 bet. Buddy was a special dog and went where few dogs have gone — to be a greyhound service dog. He will be greatly missed by many and all who knew him or knew of him and loved him. Godspeed Buddy and heartfelt condolences to his two moms, Diana and Mary. In this photo, Buddy is listening to opera. Got culture? Please keep Buddy in your thoughts and prayers. In the past few months, Buddy has seen a veterinarian, a canine ophthalmologist, a canine dentist, and a canine oncologist. He’s had numerous procedures and pills. During all of it, he continues to wag his tail. This Friday Buddy the greyhound will have his eye removed which will allow him to be free of pain and medications and allow him to continue his wonderful quality of life. Buddy raced 155 times. He deserves a greater chance to be a couch potato and enjoy his people and his friend Barney the cat. Buddy, all your friends and admirers in Tucson and beyond wish you hugs and wellness. All positive thoughts and many prayers for Buddy and his family! May the greyhound angels be in the operating room to make sure the procedure goes smoothly. Anabel and I were talking about Buddy and I volunteered to go on Friday to oversee the operation, but my Mom told me I lacked a medical degree and I was no angel! Right below the belt: of course, Anabel cracked up. Buddy, my pal, Anabel, me, Ice and our guest Paco send you a ROO of support. We’re so sorry that you will be losing an eye, but very happy that your qualify of life will be restored. You have a very loving Mom that will make sure you don’t walk into furniture and will train you how to readjust navigating the home. I’m sure this will be a breeze as we greys are smart critters. My mind will be focused on you tomorrow – Friday. As a Leo myself, I know how focused we can be when it’s something important, and you’re very important to all in the greyhound community. Keep your muzzle up! Lots of love and may the white billowing clouds I’m sending your way give you a soft landing. Best wishes to the wonderful Buddy! I know moms will understand how difficult something like this is. Buddy is a key member of the greyhound community and he will be needing to keep doing his job as ambassadog! He will be the most handsome one-eyed wonder dog EVER! My thoughts and hopes are locked onto a successful surgery tomorrow. Thanks for the upbeat messages! Lizzy, you are right, Bud will be the most handsome one-eyed wonder dog. Glenda, thanks of the wishes of a soft landing. Beamer, I like your attitude. Jean, we’ll accept all donation prayers as well as loose change. Buddy Update: Buddy was in surgery for 2 1/2 hours. It was very extensive. All the test results will come back Monday from the U of AZ lab. Hopefully then we will have some conclusive answers as to what is going on. Bud spent a restful night at the clinic and will be coming home this morning. Now will come a time of healing and Bud getting use to two dimensional sight. I know he will continue to be an ambassadog for Greyhound rescue. Thank you all for the emotional support. Please continue to keep us in your thoughts and prayers. Thanks for the update. Please keep us updated to his and your progress. Everyone in the Buddy household is very brave. Sending love and hugs and prayers for Buddy. Such a beautiful boy! Recover quickly!!!!! Sail On Buddy – romp and play with all of your buddies on the other side of the bridge!!! We salute you and your valant effort! May you find comfort and peace at the Bridge. Please say hello to our Max, who went to the Bridge on Christmas eve. Run with the Angels Buddy!!!! Beautiful Buddy, dear sweet boy . . . run free!!!. I am beyond sorry and heartbroken for Buddy’s loss. It’s such a shame that these precious dogs go through what they do for the sake of gambling and then for this poor boy to endure such major health issues when he should have been enjoying his life. Thank you to all who so devotedly cared for and loved him during these last few months. I hope he is finally at peace, pain free and happily chasing all the bunnies at the Bridge. Buddy…run fast and free now sweetheart and rest on the softest of Angel’s wings.